Hall of the Mountain King: Review: Seven Witches, "Amped"
I've always had an appreciation for guitarist Jack Frost's blend of traditional and power metal, and Seven Witches' latest effort is no exception. The first thing you'll notice, as with any Frost release, is the in-your-face guitar riffs. "Amped" certainly has more than its fair share of them, from the opening track on. 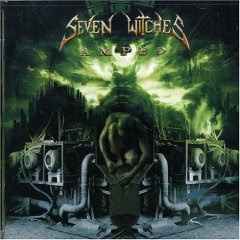 Seven Witches have often been compared to Iced Earth, and there are certainly similarities beyond being among the few U.S. purveyors of this style of music. Both are led by an outstanding guitar player with a knack for cutting riffs, and new vocalist Alan Tecchio certainly fits into the mold of past Iced Earth wailers at times. Despite the similarities, Seven Witches is certainly no Iced Earth clone. Actually a closer comparison for me would be Chris Caffery's 2005 release "W.A.R.P.E.D.." It's got the same style and feel as this record, particularly on songs like "Fame Gets You Off." One thing here that's a little different than the past is an obvious turn toward a classic traditional metal sound. The riffing is not always high speed or highly technical. For example, "Sunnydale High" features a prototypical, fairly simple, old school metal riff, and Tecchio's vocals get a little bit of a gruffer hard rock edge to them. The band also explores some electronic sounds on "Dishonor Killings," which has one of the catchiest melodies on the record. There's also a nod to prog in the opening of "Red," and a classic arena rock approach that leads into a galloping "Powerslave"-era Maiden sound on "Widows and Orphans." A clear difference from Iced Earth comes in the area of songwriting. While most of the songs are not bad, some leave you scratching your head. "GP Fix," an ode to Moto GP racing, is one of the weaker premises for a song that I've heard. It's otherwise a good song, but I guess since I can't relate to the band's passion for the sport, it really doesn't connect with me. Likewise, "West Nile" is a little weird for me, perhaps because I'm from an area that gets hit pretty hard by the disease every summer, and it hits close to home. There are a few middle grounders here, too. While I don't dislike the ballad "BE," it is a little vanilla when compared with the rest of the album. And I really just can't make up my mind on their cover of Billy Idol's "Flesh for Fantasy" because I'm such a fan of the original. The Seven Witches version is essentially the same, only crunched up a bit, but to me, the song seems to lose some of the nuances in translation. Tecchio also doesn't pull off the dark, mocking tone that Idol gave the song. That said, I don't hate it, and in fact, with Idol singing over this music, I might like it better than the original. Frost's production here is solid, and almost perfect for the style. Ultimately, "Amped," like most of the other releases involving Frost, is pure, unadulterated top-shelf traditional metal.